As I had brought up earlier in the list, Power Rangers does incredibly well with multi-part episodes. Power Rangers in Space in particular had a great run with its Psycho Ranger episodes, and to be quite honest, this isn't the last Psycho Ranger episode on the list. What makes the Psychos great is that they have a lot of personality for Power Rangers villains. 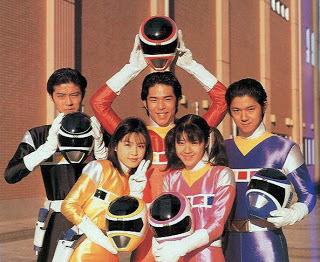 Sure, Space in general has a lot of great villains, but the Psycho Rangers stood out because they were something very Ranger fan pines for- Evil Rangers. 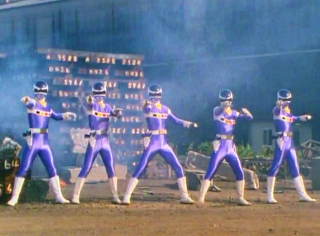 This episode also shows us a great bit of strategy in the Space Rangers attempt to confuse and take down the Psychos, ending with the destruction of PsychoBlue. This comes in the form of disguising every ranger as the Blue Ranger, and even dressing up Silver Ranger, Zhane, as "PsychoSilver" a fake 6th Psycho Ranger. We also get a look at TJ's inner monologue a bit, something Space does quite well. Even though TJ got to be leader in the second half of Turbo, his actually leadership ability doesn't really shine until In Space, where he gets to be the team's tactician. We see a bit of that weirdness here, especially with Zhane not moving right in to help his friends. (Zhane isn't exactly reserved by any stretch of the imagination.) There's also some gesticulations that just don't fit when the rangers go up against the Psychos. A weird moment also happens with PsychoBlue chasing the other Psychos off so he can fight PsychoSilver and the rangers himself. I'm not sure if this is handled the same way in Megaranger, but it's a little bit awkward here. PsychoBlue is definitely erratic and crazy, but he's also shown to be just as smart as TJ, and this comes off as out of character. There's also moments here with Astronema that feel forced. It's more a fault of the script than anything else. Certain bits of lines are repeated as she trails off in certain places. Rita seems to be borrowing a lot from villains other than Rita in the new movie, including Astronema. (Astronema, at least prior to being brainwashed, often went to fight her own battles, like movie Rita is doing.) There's also the likelihood of Rita being a former ranger, who has gone crazy. I would love to see some strategic planning as the movie rangers go up against Rita, as they seem to be fairly outmatched, whether that comes from one of them or Zordon or even Alpha. Also, today at around 1PM Pacific (4PM Eastern) 3 of the 5 movie rangers (Dacre Montgomery, Naomi Scott and Ludi Lin) will be throwing out the first pitch at the Angels game. Check your local listings!